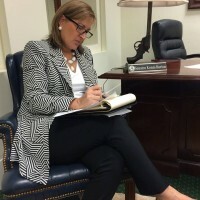 Burton shocked many when she soundly won the Republican primary in 2014–winning the majority of precincts in every city including Arlington and Fort Worth. She not only took back Senate District 10 for the Republican Party, but outperformed both Greg Abbott and Dan Patrick in the district. Sen. Burton and her team intend to be even more aggressive in the 2018 campaign. Luke Macias served as General Consultant for Burton’s successful campaign in 2014 and remains her lead political advisor. He has worked on over a dozen races since 2012 for members currently serving in the Texas Legislature and has extensive experience in building coalitions and organizing support for his candidates. In 2014, Luke worked with then-candidate Burton and led her campaign, organizing her unprecedented ground game and get-out-the-vote effort, all of which led to her outperforming the top of the Republican ticket in Senate District 10 during that cycle. Elliott Griffin currently serves as Sen. Konni Burton’s Chief of Staff and as Senior Advisor to her campaign. He previously worked in the Office of the Lt. Governor as External Affairs Director for Dan Patrick, as Transition Director for then Lt. Governor-Elect Dan Patrick, and as Political Director for Dan Patrick’s historic victory in 2014. Griffin has also worked as Chief of Staff for Reps. Wayne Christian and Matt Krause, as well as Regional Field Director for North Texas on Governor Rick Perry’s successful reelection campaign in 2010. He brings years of campaign experience with an emphasis in communications and grassroots organizing. Chris Paxton currently serves as Sen. Konni Burton’s Legislative Director. He will be relocating to Tarrant County to begin work immediately as Campaign Manager. He has worked with nonprofits with an emphasis on state and local activism and worked inside the Capitol as well, serving as Chief of Staff for Rep. Matt Shaheen and Legislative Director for Rep. Scott Sanford. Paxton’s unmatched attention to detail will make him ideally suited to head the logistics of a state senate campaign. His primary focus will be on building and deploying the largest field operation in the history of Senate District 10. Jonathan Silva currently serves as Sen. Konni Burton’s Field Director. He will assist the Campaign Manager in identifying and utilizing volunteer resources. Silva has extensive experience in the field, working most recently as a Field Representative for Sen. Charles Perry and Governor Abbott in their successful campaigns. He has also worked other canvassing operations including time with the NRA in a presidential battleground state. Silva has been walking Senate District 10 for months, identifying support and building Burton’s grassroots network for 2018. Bunni Pounds will continue her role as lead fundraiser for Sen. Konni Burton. She has over a decade of experience in Republican fundraising and has helped raise millions of dollars for her clients. Pounds began working with Burton in 2016 and has organized several successful events which have broadened the senator’s base of support. Chris Perkins worked as lead pollster for Burton’s successful campaign in 2014 and will return in the same role for her reelection effort. Perkins brings over a decade of experience working on behalf of Republican candidates and is considered one of the top in his field. He has been named one of Capitol Inside’s “Texas Power Consultants” for three consecutive election cycles and has a reputation as the most accurate pollster in Texas during that time. Vici Media Group, an Austin-based digital media firm, has been with Sen. Konni Burton since she first announced her candidacy and helped craft her digital outreach in the 2014 primary, primary runoff, and general elections. Since that time, Vici has worked across the country on high-profile races involving the United States Senate and House of Representatives. Vici specializes in developing specific messaging and delivering content to targeted audiences which translates to voter engagement. Raz Shafer and his team at Frontline Political Strategy have experience running complex ground operations in races across the nation. They most recently deployed teams in Montana for the contentious special congressional election. Shafer and his team were a critical piece of Burton’s field operation in 2014, working alongside volunteer and full-time staff to deliver her message directly to the voters.